There are different categories of free antivirus software available from various vendors which you can download from the internet and install in your system. But not all are as efficient in detecting malicious programs like Bitdefender Antivirus Free Edition. The program is the only security solution which is compatible with latest versions of Windows operating systems such as Windows 8 and Windows 10, making it a great choice for enterprise as well as home based customers. 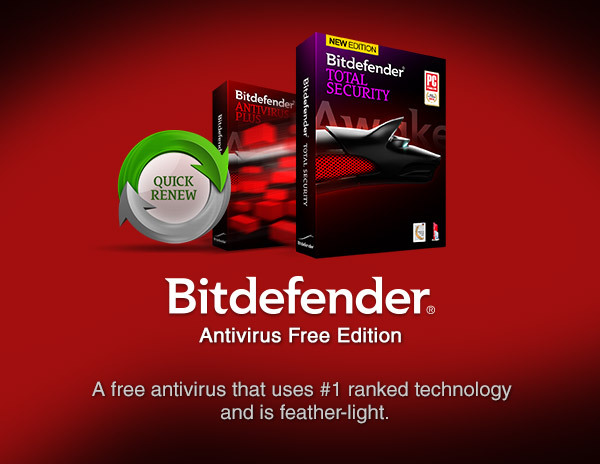 Bitdefender Antivirus Free Edition is designed in such a way that it can detect all the cyber-threats and viruses instantly without using much of your CPU and memory resources. The software has been designed with artificial intelligence to detect all kinds of malicious software instantly and protect your system from attack by hackers. Some of the features of this software include. This is an important feature for any antivirus software which involves scanning all the incoming traffic from the outside world and outgoing traffic from your network. It will monitor the traffic for any violations of security policies and will alert you in case of any suspicious activity. It will also try to detect any malware applications within your enterprise network which try to access internet and download harmful stuff to your systems. Bitdefender Antivirus comes with a network based IDS which will constantly log the entire incoming network traffic and alert the users in case of any suspicious activity. It can scan for viruses automatically which saves lot of time and resources for you. You can also schedule periodic scans based on your requirements. Browsers use HTTP protocol for surfing through various websites. But HTTP is not secure by default and hence HTTP traffic is vulnerable to phishing attacks and data theft by hackers who promiscuously monitor your web traffic and steal confidential data. Bitdefender Antivirus has in-built HTTP scanner which can safeguard your machine from such phishing attacks. It will block any unsafe traffic coming from the outside world. Even if you click any malicious web links, it will block such traffic by using it’s artificial intelligence. It is an advanced feature which enables Bitdefender Antivirus to detect possible threats and virus attacks in proactive manner. It automatically updates the database with latest virus signatures and keeps continuously scanning your system for new virus threats. If any threat is detect, automatically the virus will be quarantined and deleted. It is an important feature which enabled the real-time defense of your system from malicious programs and also preventing the spread of viruses from infected files without your PC. Rootkits are dangerous software which gets activated automatically when your system boots up. Also they can operate in stealth mode which makes it difficult for Antivirus software to detect them. But Bitdefender Antivirus Free Edition has in-built intelligence to detect root kits and prevents them from getting activated. The Antivirus uses certain advanced techniques such as memory dump analysis and signature scanning to detect such rootkits and removing them in safe manner. When you are busy gaming, you don’t want your system resources to get hogged by antivirus software. Bitdefender Antivirus Free Edition has in-built intelligence that will automatically pause the system scan when you are gaming and will resume only after you quit from the Gaming Application. This cool feature will sense unknown threats by analyzing the behavior of applications in a safe environment. If it does not detect any malicious activity, it will start the application in normal mode, or else it will quarantine the application and delete it. Bitdefender requires a minimum operating system version of Windows XP, Windows 7 or Windows 8 to be installed in your system. Also it requires 512 MB of RAM and 700 MB of free hard disk space. You can download it for free from the Bitdefender website. It is very efficient in detecting the viruses and in our experience is better than competitor products such as Avira, Avast and AVG. Also this is the only free antivirus software which does not display ads.